These lightweight foam nunchucks are perfect for beginners new to nunchucks as well as pros training for new moves. PVC pipe cores with a thick foam covering, these are designed not to cause damage if they strike your body. The golden Japanese dragon insignia and metal chain assembly gives them a genuine martial arts look and sound. They measure 30" in overall length and weigh about 9 oz. 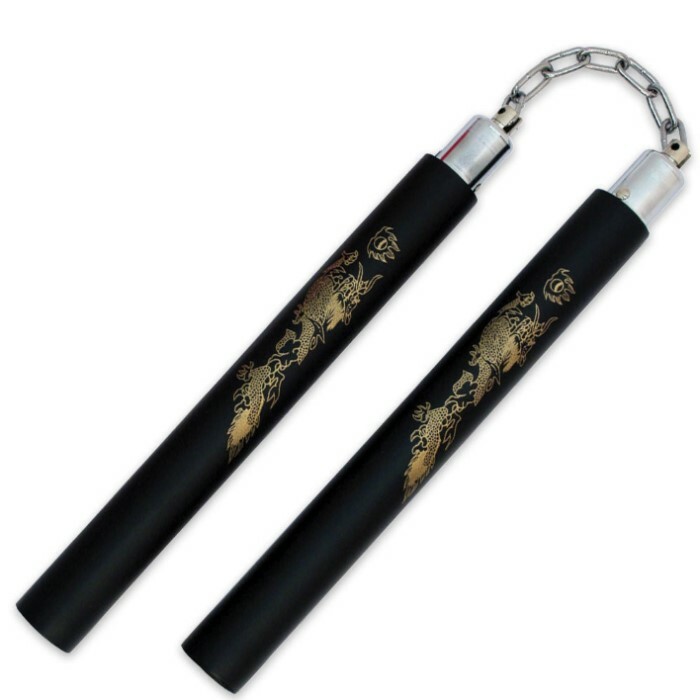 These are very good practice nunchuks for their price. They have a good grip and some weight to them and they still hurt if you hit yourself, but not as bad as a non-foam chuk. These nunchakus trainers were pretty good. These are my first pair, and they have good weight to them, preparing for heavier, real nunchakus. They also have a nice grip and design! I would recommend this for a customer. I have bought foam chucks before, these are much better quality than I expected, good weight, good for middle school aged kids (and me). The nunchucks were fantastic I pretty much them through hell and high water, so to speak, and my only concern is how soon I needed to replace the plastic core. All together this was a wonderful product though, and it's a perfect training tool or introduction to nunchucks. These are really good for training. When others say that they don't hurt, I think they mean compared to the real ones. But great buy; and like everyone else said, the design rubs off pretty fast. Nice arm workout too. Oh Man, These Are Awesome! I Purchased The Steel Nunchaku Also But I Don't Train As Hard With Them As I Do With Foam Nunchaku. These Are The Best Things Since Sliced Bread! I Suggest Buying 2 Because When You Get Skilled You Can Use 2 Simultaneously. It Takes Practice But The Foam Makes It Less Risky. I Also Purchased The Dual Set Of Hardwood For This Reason. In a minute I'll explain you the pro's and con's of this product. This came as my first purchase. 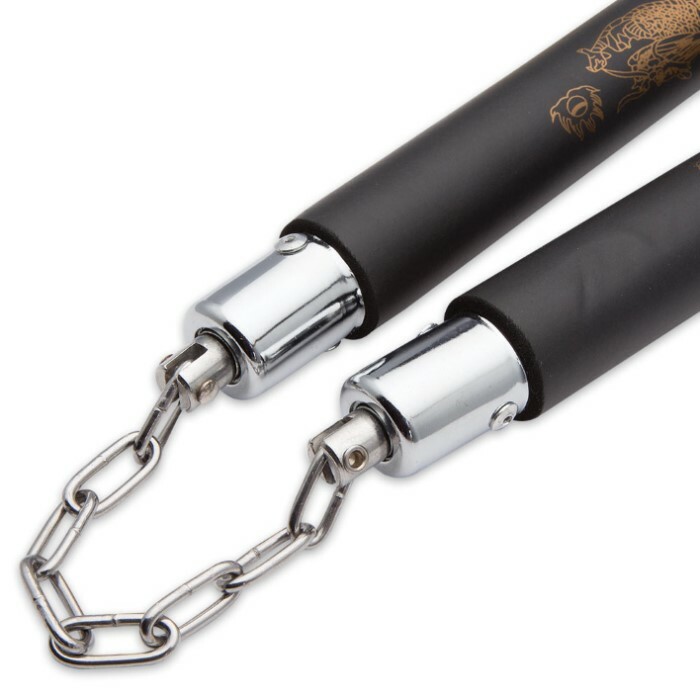 This Nunchaku is perfect for practice; it doesn't hurt as much as a metal one. Pros: Foam lessens the impact of the weapon. Easy to grip even for someone with medium or small size hands. Cons: the Paint will wear off soon or later.